The '''Group Pay''' module allows any user to purchase additional premium time for a website. By default, a group pay module is automatically placed on any new website's home page. Users can donate additional premium days to your site the moment it's created. However, you may want to edit this module. Title: Allows you to modify the large font title of the group pay window. Description: Allows you to modify the short description of the group pay. Try making a joke, or just standing out in general. Number of users to show: This integer controls the size of the list of users that will be shown. Users on the list are those who have donated to your site. Group Pay allows payment through Paypal or by filling out promotional offers from Enjin affiliates. If you are currently on a Paypal or Credit Card subscription, your subscription will continue to charge until you cancel it directly. What happens if I change plans? If you want to change plans you will need to click PREPAY or GET IT FREE in your plans & pricing page and prepay for at least 1 month or complete a TrialPay offer. Your users cannot change plans for you, then can only add days to the existing plan. 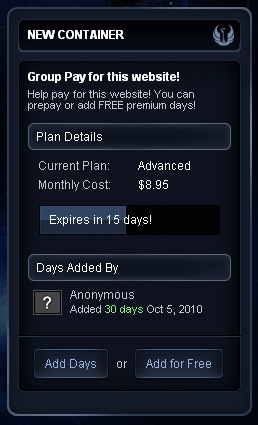 You days will automatically be credited and converted to the new plan you choose. If you are on the Free plan, then any users who add days to your website will automatically upgrade your website to the Advanced plan.